The tomatoes I showed you in my last garden post were the spring planted Romas, making an amazing comeback. The ones pictured above are entirely volunteer. These look like Rutgers, which just popped up from seeds surviving the compost. As you can see, they are producing beautiful tomatoes. I'm doubtful they'll have time to ripen before first frost, but one can hope. Actually, last year, I managed to keep my tomato plants alive by covering them at night whenever frost was predicted. I was successful until December 1st. This year the plants are spread out a bit more, so maybe I can choose a few to protect. 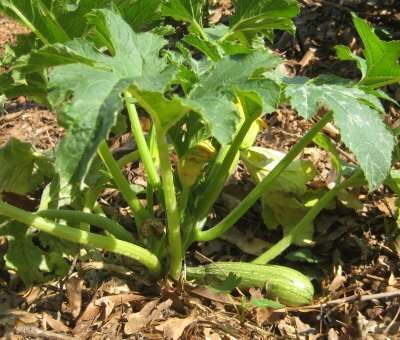 Except for powdery mildew, the late planted zucchini is doing well. Of 15 seeds planted, only three plants grew to produce. Still, even that is enough zucchini for the two of us! 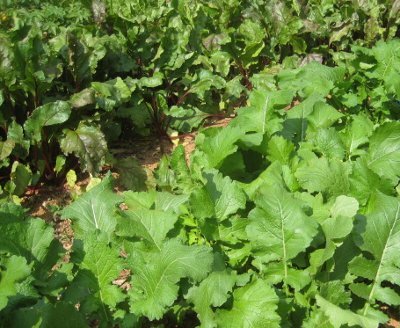 Fall plantings that are doing well include carrots, beets, and turnips. I planted the carrots first. They are Scarlet Nantes, a new variety for me. The goats love the leaves from these. The beets (in the back) are Red Detroit from purchased seed. 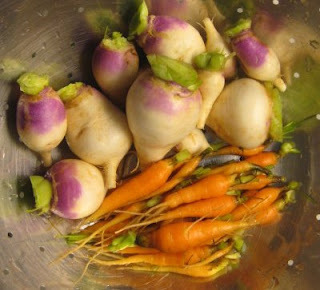 The turnips (in the front), are Purple Top White Globe from seed I saved. On the goats' scorecard, beet greens come in second after carrot tops, followed by turnip greens in a "well, only if you don't have anything else" third place. I've never had any of these root crops do this well before. Some are very ready to be harvested. All of them were badly in need of thinning. Enough thinnings for salad and roasting. 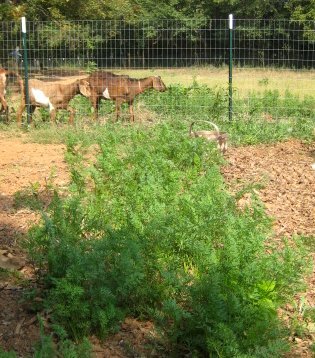 I am so pleased with how the carrots look so far, as our heavy southern soils aren't conducive to carrot growing. It seems even the few improvements we've made so far are beginning to pay off. The beets, I decided to pickle. 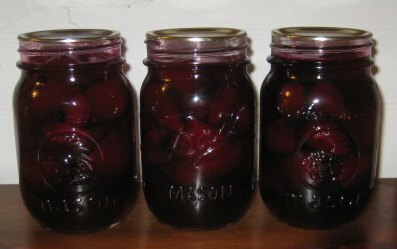 I wouldn't have ever thought to pickle beets, but after reading Robin's post about them, I wanted to try it too. Our library doesn't have a copy of the cookbook she mentions, but I found the recipe nonetheless, here. I had to cut the recipe in half and didn't have the ginger or anise, but when I tasted the pickling syrup, heaven! I only hope the remainder grow well and produce lots, though I need to let a few plants go to seed. 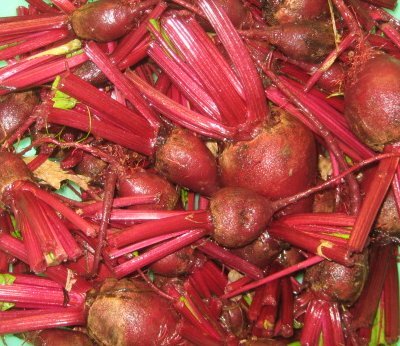 I will definitely be planting beets this spring too, just to make sure we have plenty of these pickles on hand. Three pint jars isn't going to last long around here. 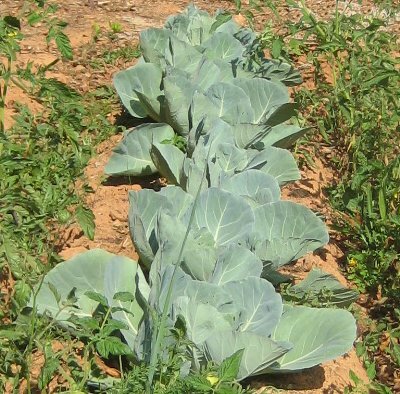 Things that are coming along more slowly, are my cabbage plants. These were from a garden center. These are flanked by more volunteer tomato plants, which are taking over my fall potato patch. 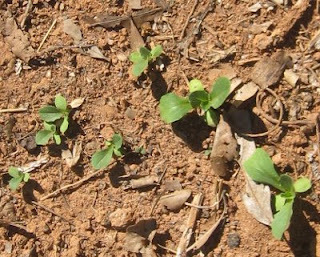 Even so a few fall planted potatoes are coming up. 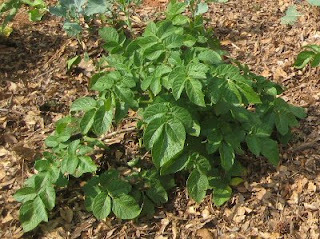 More prolific however, are plants from potatoes we missed during our summer harvest. These sprouted from unharvested spring potatoes, and so are interspersed with the broccoli. I have about a dozen or so plants, which have already flowered. We'll harvest them after a frost or freeze kills the aerial parts. Speaking of broccoli, it too is coming along slowly. The variety is a new one for me, Watham 29. It's open pollinated and supposed to make larger heads than the Di Cicco I've been planting. So far I've seen no sign of heads however. About that chicken. This particular chicken, one of my two Ameraucanas, loves to come see whatever I'm doing. Even though the chickens are fenced in with the goats, my Ameraucanas are fliers, and always come out to forage in the yard. When it first happened, I told myself I needed to clip their flight feathers. 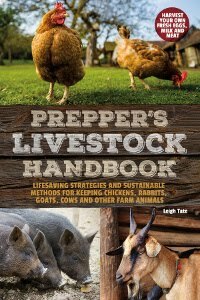 But they generally stick close to where the other chickens are and haven't strayed across the street (where they could get into the neighbors' yards). Anyway, this one always runs up when she sees me. I'm not allowed to pet her mind you, but if I don't touch, she's right there with me for whatever I'm doing. The grand champion of slow this fall, is the lettuce. This is Parris Cos, from saved seed. I planted it the last week of August, and it's just now starting to sprout. ????? These are Pink Beauties, planted the same day as the lettuce. The seed package was a thank you from a Baker Creek Heirloom Seeds order. I planted a generous sprinkling, but these three are the only ones that grew. I planted more later, a winter variety called China Rose. I am looking forward to trying the Pink Beauties though. We've always grown Cherry Belle and I'm ready to try something different. The only no-shows I've had this fall have been the onion seeds I planted, Yellow Ebenezer. I reckon that means I won't be making my own onion sets this fall. Ah well. Another research project for this winter. And there's always next spring. Another way to ripen your tomatoes when the weather gets bad is to pull them up, roots and all, and hang them upside down in a cool, not cold place. The fruit will continue to ripen on the vine. I've never done this, but I know people who have and say it works really well! 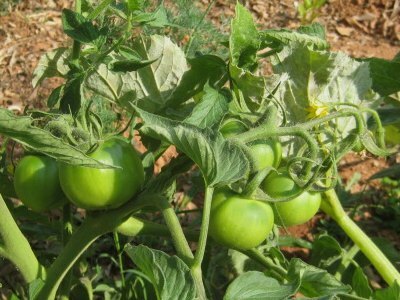 Leigh, you really need to read this post: http://inmykitchengarden.blogspot.com/2010/10/how-to-ripen-green-tomatoes-indoors.html It should save you a lot of work, as well as give you some great uses for green tomatoes. I LOVE her no-sugar-added green tomato relish (a salsa, really)! Your garden all looks great! So different than our dead and gone plots. What a difference location makes, huh? Scarlet Nantes are my go-to carrot variety. I plant them in one of our raised beds where the soil is very rich and friable so we always seem to get nice, long, fat ones. They're sweet this year, too, which is always a bonus. Your lettuce is a conundrum . . . did it get enough water after planting and before sprouting? We've already had a frost or two, but my plants don't seem to know that much. I'm thinking of tossing this year's compost over the entire garden and seeing what happens next year. Those veggies sure look good. I love beet greens too. Laura, I read about this somewhere, but had completely forgotten about it. Thanks for mentioning it! I will definitely have to try this with at least some of my plants. Benita, this recipe is supposed to be for folks like you, who don't care for beets. That's one of the reasons I was interested in trying it. I like beets but Dan wasn't too sure. He's like the baby beets with greens, steamed. I have too. They've been wonderfully tasty. I've read beet juice doesn't dye like it looks. If you give it a try, I'll be interested. Michelle, thanks for the link! I will most definitely be needing some green tomato recipes so I'll have to see what she'd got. Mama Pea, I think water was the problem. Or lack of it. We haven't gotten a lot of rain and I've been sporadic in watering. Still, I'm surprised the little suckers didn't sprout and then dry up! It's interesting to see how gardens are doing in different places. I know folks envy our long growing season, but I doubt we'd have many takers for our long hot summers! Renee, I'm definitely going to try that with the tomato plants. And I would definitely do that with my compost. It will make a noticeable difference next year. Evelyn, thanks! Tonight while I was cutting onions and peppers for pizza, I was thinking how wonderful it was to not have to buy them. Pizza sauce too. Superior quality veggies practically for free! Who can beat that. We adore beets here, but I can't get anyone else to eat them pickled. I had a wonderful year for root crops as well. Having never done well with carrots, I got some good ones this year. compared to my mess your garden looks great! thanks for the link to the beetroot recipe, I love them, though usually raw or just cooked, because most pickles are just acidic. looks like a lot more flavour in thins one! btw - try beets baked in foil with some herby cream cheese (or sour cream) - yummeeh! 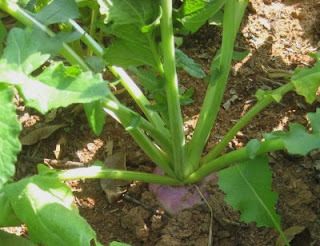 Your root veggies and others look fantastic, I love seeing all of the pictures and am jealous of your radishes...mine never turn out. I'm glad to hear that you are having a good year for the carrots, beets, and such. Tomatoes in the garden all the way until December....wow. Your garden is beautiful still, Leigh! Your garden looks fabulous! I've been enjoying this gorgeous fall weather too. I can't remember ever having such a lovely October. I'm curious how you're able to use the amount of radishes you're harvesting. You must be doing something more than just slicing them in salads. I didn't know about onion setsso cut and pasted that last pp and sent it to Ian. We should try that. Heather, pickled beets are new for us too. Actually, I'm the one in our family who doesn't much care for pickles. These though! WOW! Bettina, that must be why I don't ordinarily like pickles, the acidity. I'm wondering how the red wine vinegar will change things. They have to sit three or four weeks before we can try them. Thanks for the idea for baking them! Sounds very yummy indeed. I've never tried icicle radishes. I confess I've been very non-adventurous when it comes to radish variety. Ditto with carrots. I've always grown Danvers half long because they're supposed to do well in heavy soils, but mine have always done poorly. I need to try some new things next year! Mr. H, thank you. 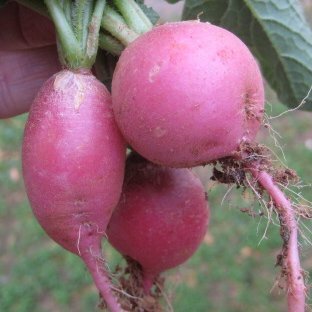 After looking at your root crop post, it's hard to believe you've had trouble growing radishes! I reckon we all have our challenges. Mary Ann, thank you! We have been so thankful for the beautiful weather. A real treat! Sharon, about all I do with radishes is salads. And I send some with Dan when he goes out, for a raw veggie snack. Actually, I wouldn't grow them for myself, but he loves them. Everything looks amazing and yummy Leigh. Sorry your lettuce didn't co-operate. My Grandma always made pickled beets and we had them at family get-togethers. To this day when I have them they remind me of her. How cold does it get where you live during the winter? How yummy your garden looks! We've only some leeks left and the Dyer's Knotweed. Everything is pulled up and we're composting for the winter. I am slightly envious, in a good way of course, of your marvelous fall gardens! 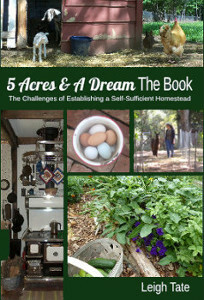 Vicki, that's the mystery and challenge of gardening, isn't it? What will cooperate and what won't! Our nighttime temps get down into the low 20s, with daytime temps getting above freezing. It can get colder, but that's pretty typical. Because if that, there's no year round gardening for us. We do get snow, but the biggest winter threat are ice storms. These consist of freezing rain which coats trees, tree limbs, shrubs, and power lines with a heavy layer of ice. If too heavy, ice laden trees and branches come crashing down, damaging property and knocking out power. It's typical to have at least one of these a year. Nina, you'd have to have our hot, sticky summers to get our growing season! I have to admit there are days when I don't think the trade-off is worth it! 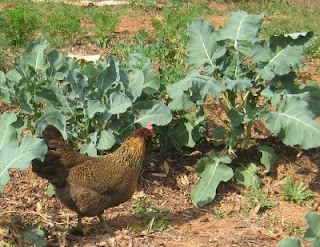 Robin, no damage to the broccoli plants, but I have noticed that my newly planted mesclun patch has been drastically rearranged in a chicken scratch pattern! ;) I have high hopes for the beets. Dan has been enjoying the beet thinnings, steamed, and roasted beets, so I think he'll like the pickles. I'll have to let you know! "A Day In The Slow Life"